St Helena Tourism Roadshow 2017 – Derek Richards – What an awesome flight…. SA Airlink SA8132 touched down at OR Tambo at 20:35 local time and the St Helena Tourism Roadshow were on the move, passport control, baggage collection and a hotel transfer to the Southern Sun meant that everyone was tucking into a dinner by 10pm. The Southern Sun is a well reputed establishment at the edge of the airport with efficient and pleasant staff and well maintained fittings. It is also very busy with travellers from all over the world staying there. The mornings running around and flight had taken its toll and everyone turned in for the night, but not before Niall had briefed everyone and updated them on slight changes to the schedule. 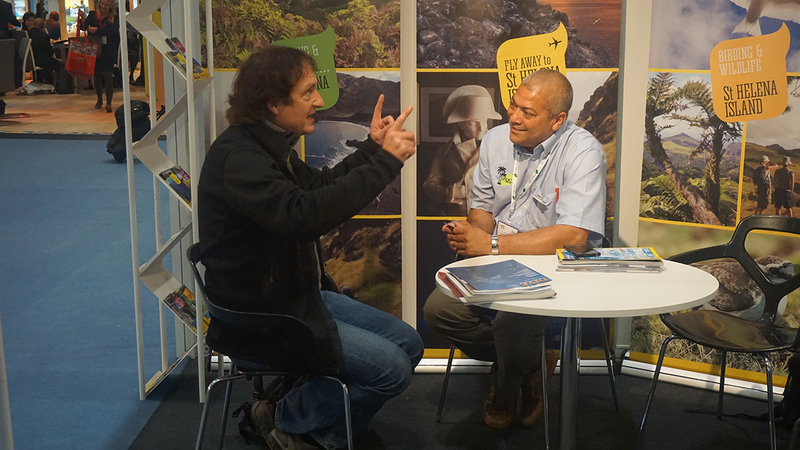 There were changes to flight details and everyone encouraged to think about what they wanted to do in the morning before flying off to Heathrow and the real hustle and bustle of the World Travel Market) (WTM) London. London Heathrow – Monday 6th November 2017 – Arrival at 7am. A long flight and now the ardent task of negotiating London traffic to get to our Hotel. Fortunately Melissa and Kelly had arrived the previous week and completed setting up the St Helena stand (AF362) in preparation of our arrival. Having been previously briefed that the event would be massive, intense and fast moving, had not prepared us for what was about to happen. Visitors from all over the world descended upon us like there was no tomorrow… questions came from all quarters as everyone demanded to know all about St Helena, how to get there and what to expect. The onslaught was overwhelming, within an hour I had met with 9 tour operator and potential visitors to St Helena, all of whom, knew about St Helena, about our new airport and many had visits in the pipeline planned for 2018 and this was just the start. This trend continued over the two days that St Helena was represented Island Images distributed more than a thousand brochures, some 500 hundred business cards and 500 promotional pens….. and that’s with another day at WTM London to run. Dis we have any indication of the size of the event?… Chief Executive Niall O’Keeffe had said it would be amazing and intense, but nothing had prepared me for the expensive array of displays, products and presentations from more than 180 countries from around the world and over the three days it was expected that in total some 50,000 people would walk through the doors of the World Travel Market. 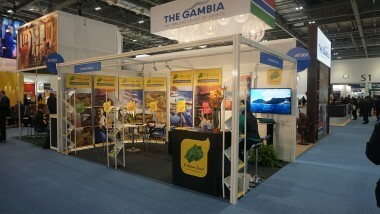 So how does St Helena fit into all of this?… Having often wondered what goes on at such events, it is very clear that whatever number of visitors to the Island would have been influenced by St Helena’s attendance at the WTM, the knowledge, experience and exposure gained by each and every one of the 11 strong group representing St. Helena is invaluable. Of course, compared to some countries represented at the WTM, we are indeed punching above our weight, but the timing is right, it’s going to take this island many years to be able to compete with some of the bigger names in the tourist industry, but we must sell St Helena for what it is. We are proud of our natural beauty, our history and heritage and our adventure options are second to none. We must promote St Helena as such and in the eyes of the outside world, more so, those who visited us over Monday and Tuesday, they believe that as well. We were exposed to many hundreds of square metres of displays, many valued at hundreds of thousands of pounds, yet a small 3 x 5 metre display ably set up by Melissa and Kelly, competed and bettered some countries who receive income from tens of thousands of tourists each year… an there the message is simple – St Helena is open for business. So whilst we sit on the Euro-Star to Paris at 7am on this chilly morning, each of this well co-ordinated team is basking in the aftermath of a successful event, knowing that they have done St Helena proud.